The Kayak13′ RK396 is simple and elegant Fishing Kayak. This kayak slides through waters easily, controlled by the passengers cruising through rough or calm waters. This kayak was designed for high quality material, and the drop-stitch high-pressure airdeck floor is the most rigid inflatable floor on the market. The kayayk can support up to 3 adults. Design is important, and the thirteen foot kayak we provide was made to glide using its narrowed tipped nose and tail to maneuver easily. Interior is at its most comfort, a long adventure on the lake or ocean side gives the passengers more than quality and comfort but trust in the security of well built kayaks. 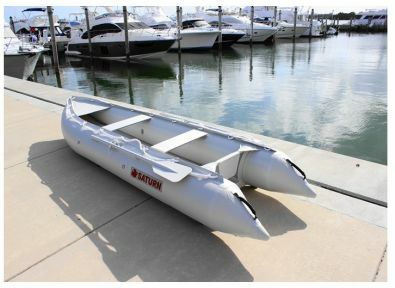 The 13′ Saturn Fishing Kayak comes with 2 removable aluminum benches that can be used for mounting various hardware, such as rod holders, GPS units, video cameras, dive flags, anchor mounts, and even a fish finder. This kayak was designed for lakes, ponds, flatwater rivers, oceans and bays. If you are looking for a self-bailing kayak, no need to look any further than our 13′ Saturn Whitewater Kayak. If you want this specific model and absolutely need it to be a self-bailing unit you can cut out 4-6 self bailing holes in the kayak bottom to let excess water escape. However, that option may allow water to entire above the kayak floor depending on the weight capacity. I never had inflatable boat and therefore listened to the advices of my friends and experts. On their recommendation, I bought a 11′ Saturn SD330 boat. And I spent time testing my dinghy. 11′ Saturn SD330 boat is wide and long boat and has enought space to place beach chairs or even fit beach lounger inside. You can stand on the air floor just the same way you would stand on a plywood floor. Despite being wide and heavy, this boat can plane even with a small 2-stroke 5HP outboard motor. The boat worked well when loading three or four passengers. Therfor I am quite pleased, and I think I did a good purchase for a very reasonable price. Good s Inflatable Fishing Kayak – SATURN FK39. Yes, I wasn’t a fan of kayak for fishing. I always thought that using a kayak for fishing would require an additional skills. And also I thought that kayak it’d be a tippy platform, and that overall it’d be a pain in the neck. During those days I did not have thought to buy kayak for my fishing fun, but then a friend showed me his inflatable SATURN FK396 kayak. I got in and paddled and fishes. After that first experience I never looked back. Don’t get me wrong, my boat is not for sale. But it is Good! Made with of the heavy-duty 1100 Dtex PVC as inflatable boats and rafts. The floor is made of a high-pressure air deck that is extremely rigid when inflated, but can be rolled up when deflated. In addition, a double layer of PVC fabric is applied to the air floor and on top of the tubes, in between the benches to prevent accidental fishing hook accidents. Rigid high buoyancy tubes make Saturn FK396 kayak so stable, that you can stand up and fish if You need! And is easy to carry and portable! Important? Yes! I haven’t used my kayak in all types of waters, but I’ve fished from it in saltwater river systems, along beach fronts, along boulder fields, and on freshwater lakes and ponds. It’s opened up a lot of previously closed fishing areas to me, and I’m thankful for that. Now is a good time to look for a kayak; a lot of shops that rent them during the season sell them off for a big time discount. It’s been a decade since I got my first boat, and I am glad I did. Me, my wife and our kids – an average family. Often we spend time together. We spend a lot of time at various sports – hiking, biking, or playing sports. We are enjoying nature together. Our favorite time when we spend the day out on the water in our Saturn inflatable boat 11′ SD330. 1. It is extremely durable. Obviously, I wanted an inflatable boat that would last a long time and would also be a safe vessel for my family to spend time on. Well, the SD330 is all that and more. Made of heavy-duty 1100 denier Korean VC fabric with polyester support, this inflatable boat is very resistant to breaking, tearing, and popping. To this day, we have still not had any issue with durability on our SD330. 2. The Saturn SD330 has been specifically designed to be sturdy and strong out on the water. Once the high-pressure drop stich air deck floor is inflated, there is no difference from standing on your inflatable boat to standing on a plywood floor. But performance-wise, you still have the added advantage of maneuvering a light boat, which is something my son Michael always raves about. 3. It is convenient to move and store. Just like with most of the other Saturn inflatable boats carried by BoatsToGo, the SD330 is incredibly convenient when it comes to storing and travel. I can easily inflate it with the complimentary hand pump it comes with. Then, once we are done using it for the day, deflating it is a snap. After that, I just toss it in my trunk and we are on our way home. It can even be packed in a standard piece of luggage for a family vacation! 4. It is affordable. We do fine at work. However, we really couldn’t afford a hard-hull boat with its up-front costs, storage costs, and repair and maintenance costs. For us, inflatable boats were just right. And 11’ SD330 Saturn Inflatable Boat was truly affordable to us. It also doesn’t require things like storage , we can just deflate it and store it in our garage. 5. It’s the good size for our family of 4. Saturn has a lot of inflatable boats. And when I made researching which one to buy for my family , I went through all of them on saturninflatableboats.ca and decided on the SD330. It was a right choice and I have never regretted it. This inflatable boat has a maximum seating capacity of 5 people, which makes fitting 4 people on it for a day out on the water very comfortable. Just received SD365 SATURN inflatable boat today! Just received SD365 SATURN inflatable boat today. I really expected this inflatable boat would be well made and pretty, but I want to tell that it is even better than I expected! My inflatable boat I am going to use for fishing. A good job of workmanship. All seams are neatly glued. Great inflatable boat, better than expected! I bought a SD365 from you. It is a high-quality, nice inflatable boat that gets a lot of attention. The Boat is made of 1100 denier Korean PVC fabric with polyester support that. It is a heavy-duty PVC fabric and it has excellent resistance to tearing, tension and breaking! “I purchased my SD 365 3 years ago and have been extremely pleased. We have fished in the little boat from the far northern lakes of Northern Saskatchewan to the Sea of Cortez off Baja. I have a 9.9 Yamaha 2 stroke and it moves it along at about 15 – 18 miles per hour. I have a short shaft outboard but I added about a 1 inch strip to the top of the transom as I found the leg of the engine with the hydrofoil on was running too deep in the water at a plane. It helped to get the boat to plane easier. Our little boat has been portaged over Beaver Dams, run rapids in rivers, dragged across beaches in Mexico and only a few scratches. The only leak was in the air floor from a dropped fishing knife, no big deal to fix. I would strongly recommend your product to anyone who is looking for a good all round boat for all conditions. Thanks, I already bought the inflatable boat from you guys and I realy like it! If You have lack of the funds or storage space for a full size boat, than you should consider a Saturn inflatable boat. That was exactly about me, so I bought SD330 from saturninflatableboats and …. Yes! I like it very much and not only because of its good price, but because its technical parameters, extremely rigid, lightweight hull that gives excellent performance, excellent resistance to tearing (PVC fabric very strong) and moor…. I am from Quebec and I bought SD430 with Mercury 25hp 4 stroke. And first I tested it – the result is WOW! The inflatable boat is quiet the performance is outstanding and it let me drive very easy. I am fully satisfied Vic. I have received my new SD365 inflatable boat for my birthday! Its so great gift! Little inflatable boat and I love inflatable floor no more squeaks! like my old Zodiac . My dad has Saturn Inflatable SD330 and he likes it too. Actually my new Saturn Inflatable SD365 – his gift! I work on many inflatables, and when I ordered a Saturn SD330 I was not shure I will get a good stuff and my boss told me for the money I probably get junk! But when I opened my inflatable boat I’m very convinced I did a right decision and this inflatable boat will last a long time. To bad for my boss :(( he spend mach moore money! A lot of people enjoy boating during summers and others go for fishing for commercial benefits. Saturn inflatable Boats are designed in different shapes having different features to suit your purposes. we also have different kind of boats of Skiff Boat and PNG Boats which can be used by them for daily purpose and different purpose. Saturn inflatable boats, Saturn inflatable rafts and Saturn inflatable kayaks are exceptional quality and are made by the leading manufacturer of inflatable boats in South Korea. Our manufacturer is a major supplier of inflatable rafts for the Korean military, and possess over 20 patents in 12 different countries including: double wall fabric for high-pressure air deck floors and air safety valves for inflatable boats and rafts. You will be definitely satisfied if You choose boat from saturniflatable.ca You can always put powerful motor on your boat. Choose the Right Outboard Motor for Your Boat. Electric Motors are a great way to power a model boat. My Opinion about Saturn KaBoat – it is a best option from inflatable for Ontario lake. It seems to me, for Ontario, namely Saturn KaBoat is a best option from inflatable. Firstly one person can really move the boat – 30 kg it is not like 60-70 kg. It is a big difference! Secondly, for two fishermen boat requires only a small motor. 3.5 hp is sufficient for it, despite the fact that he eats less, and weighs less, and occupies less space. 3.5 hp pushed KaBoat on plane, but at sufficiently large length is not required. On a boat fishing is a real fun, no need to travel far, and 8-10-12 km / h is enough. But what about the wide inflatable boats 2.8-3.2 meter purchased for fishing on Simcoe, it seems to me that this is not the best, but simply and self-deception. Assembly / disassembly of a boat with a total weight under 120 kg, very quickly get bored. And if there is space on board the boat with friends, set stuck in the basement up to the date of sale. Only worthy inflatable transport in Simcoe seems to me exactly RIB. But it is almost always RIB trailer that negates the advantage of inflatable – compactness. For Fishermen who choose PVC inflatable boats, I would advise to pay attention to the company Saturn. Distributor in Canada saturninflatableboats.com. The entire range of boats is best represented here saturninflatableboats.com. There are plenty to choose from almost any taste at very reasonable prices and good quality (in my experience). One defining feature of these boats is really good material from which they are glued together – thick PVC 1100 denier. In my opinion, after determining the type of a new boat, it is worth paying attention to the material thickness. Judging by conversations, PVC 700/900 deinier, from which are made the same Brigham and Grants are not very reliable, and starts to flow after a year or two of operation. This is important! Only a hole that I have had on Saturn boat happened to fall on the boat uninflated heavy drills with a height of two meters. a heavy-duty workboat excellent for fishing, day trips or scuba diving. Boat glued very well. PVC – super thick, tape all seams taped. Paddles / seats – aluminum. Paddles work well, since the boat has almost no resistance, but will not be able to paddle vigorously, knees will interfere. Seam at the transom and oarlocks inspire confidence. The ramp is not necessary, strikes anywhere where a person can walk to the water. Boat + motor transferred as two passes.